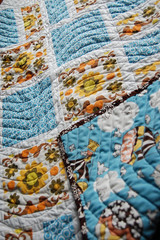 i can't explain quite how much i love this quilt, except to say that i found it really hard to edit down the pictures to post them on flickr - i wanted them all. 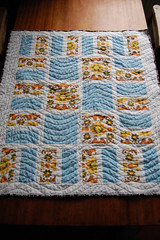 i think one reason i'm so overwhelmed might be that i've never actually had a quilt before. i don't think i'd even seen one in real life until a couple of weekends ago when we went to stay with friends who'd put their very special all-hand-stitched quilt on the guest bed for us (which inspired me to get finally moving with this one). 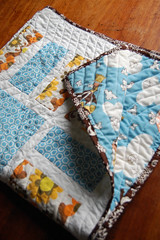 so i've never properly experienced the rumpled visual and tactile joy that is a quilt before. this came together gratifyingly quickly, always a plus for my limited attention span. the top is pieced from mostly charity shop fabrics - cotton curtains (which remind me strongly of the ones that hung in my grandparents kitchen when i was small) and a poly-cotton duvet cover which had the hexagons on one side and the magnificent balloon pattern on the other. the binding is a superbuzzy fabric that i think may have sold out there now, but is also at reprodepot iirc. after a long time sewing clothing i have to say i'm delighted that the entire quilt was made without the use of a single pin (apart from the aforementioned thousands of basting pins) - oh the joy of straight seams and neat rotary cut edges that can just be held together. 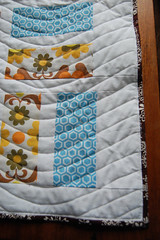 after the pleasure of piecing the actual quilting was nearly my downfall. the walking foot did a sterling job, but i made the mistake of trying to rely on the quilting guide that came with it to keep my quilting lines parallel. this might have worked for straight lines (although the fact that it sits on the wrong side of the foot, and that i had to tape it to stop it sliding to random lengths, suggests perhaps not) but it hadn't occurred to me that it would create concentric, rather than parallel, curves. not until i started. and those curves were getting tighter and tighter and harder and harder to sew. i realised at this point that i really should have lengthened my stitches for the quilting, especially if there was going to be ripping out to do. so i didn't bother ripping, just started again with the top marked. marking the top after basting (d'oh!) wasn't so bad really - i made a cardboard template and traced along it a couple of rows at a time, having removed the pins from that section. after years of dressmakers chalk and assorted other equally-not-very-good fabric marking methods, disappearing marker pen was a revelation too, although i guess the fact that you mustn't iron it pretty much rules it out for dressmaking. after reading a few horror stories about the ink reacting with detergents i made sure i soaked the whole thing in cold water to remove the marker before i washed. i chose the wavy line quilting pattern because i wanted something with a bit of movement to break up the static formal lines of the top. 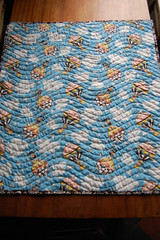 it hadn't occurred to me how much harder this would be with the walking foot than straight lines, but it didn't turn out too bad, especially since the rumpled patches i was getting in places on the top (nothing on the backing at all, hats off to that walking foot) have disappeared into the general delicious rumpling once the quilt was washed (i used hobbs heirloom 80cotton/20poly batting and i just love the difference the shrinkage makes). i was nearly stumped on the binding. i bought a bias tape maker, in the hope of managing a single-pass binding, but failed utterly to get it to work properly. it seemed to me that it didn't fold over tight enough so it wasn't feeding under the iron evenly, the "tape" was totally uneven and unusable. maybe i just need more practice. anyway, i ended up cutting 1 1/2" strips, pressed one edge to just over a 1/4" then sewed the un-pressed edge at a scant 1/4" onto the front of the quilt. then i folded over and machine stitched at 3/8" from the back (with brown thread in the top and white in the bobbin). i know it's usual to make the second pass narrower than the first, so the stitches catch the binding, but i know how uneven my sewing is, and there was a good chance that i'd end up wandering off the edge of the binding completely on the back - and you've worked out by now that i'm rather averse to ripping unless it's structural so i'd prolly leave it like that and just cringe every time i saw it. i couldn't work out a neat way of mitring the corners so i just stitched separate strips to each side and hand finished the corners. in the end i really like how it's turned out, with the neat turned edge on the front, and the row of bobbin stitches framing the rest of the quilting.